"There is little that we can do at this stage to avoid exposure to micro and nanoplastics in water and food"
There are currently more than 150 million tonnes of plastic in our oceans and waterways. Recently, the EU voted to ban single use plastics such as cotton buds and straws. While plastic pollution on beaches is unsightly, and has a clearly detrimental effect on aquatic wildlife such as birds, fish and turtles, the question of how human health is actually impacted remains under-researched. One thing that we do know is that as plastic is degraded in the environment over time, it breaks down into smaller and smaller pieces, known as micro and nanoplastics (<5 mm and <1000 nm). In addition to pollution with refuse such as plastic packaging, vast quantities of micro and nanoplastics are transmitted to our waterways from washing of clothes with synthetic fibres, use of personal care products, and items such as fishing nets. Nanoplastics are much more difficult to see due to their small size and there is no agreed method for their detection in the environment or in foodstuffs. Most of our exposure is probably not related simply to ingestion however. For example, the dust from our tumble dryers and in our houses is full of microplastic fibres (inhalation), as are many cosmetic products (dermal contact). As such it is not surprising that microplastics have been detected in human faeces. So onto the health impacts. One problem is that plastic particles can act as a carrier for pollutants that we know are definitely bad for human health, such as metals, pesticides, polychlorinated biphenyls (PCBs). They are being concentrated on these plastic particles which is a route to higher human exposure than might otherwise be the case. They can also change the biological effects of the pollutant itself. Plasticisers such as phthalates and bisphenols are added to plastics to make them flexible and have been shown to affect the human reproductive system and fertility, and cause problems in developing foetuses during maternal exposure in pregnancy. Most studies on the effects of micro and nanoplastics on biological systems focus on marine mammals or invertebrates. We know that microplastics are poorly absorbed via the gastrointestinal barrier into tissues, but nanoparticles have been shown to overcome this and to translocate into the underlying tissue. We know that nanoparticles are taken up by human cells – there is a wealth of research on the use of nanoparticles as drug delivery systems. We don’t yet know if this is the case for nanoplastics in humans, but fish exposed to nanoplastics have exhibited behavioural changes and the nanoplastics have been shown to cross the blood brain barrier. While microplastics seem to have a reasonably benign impact, nanoplastics have been shown to impair fertility of oysters and to impair immune system responses in fish. Much more research is needed into the impact of nanoplastics on human health and we have no research as yet on the long term effects of chronic exposure with multiple types of plastic and multiple exposure routes. DCU Water Institute, funded by the EPA and led by Dr. Sandra O’Neill, is currently embarking on a study to examine the effect of micro and nanoplastics on the human immune system. Studies on other types of non-plastic nanoparticles have shown effects on the central nervous system and reproductive systems in humans and it is likely that detrimental health impacts from nanoplastics will also be found as the research progresses. Unfortunately, there is little that we can do at this stage to avoid exposure to micro and nanoplastics in water and food. Research is ongoing to develop technologies for detection and minimization or removal from drinking water, but this is going to prove particularly difficult for nanoplastics. For example, there is no evidence to suggest that eating organic food will reduce exposure. It is likely that exposure by inhalation accounts for far higher than ingestion, although reducing cosmetic use such as spray antiperspirants and nail varnishes may help. Infant exposure to plastics and plasticisers is higher on mg/kg basis than adults. Disposable nappies have only been widespread for the past 30 years so the long term health impact of two to three years of wearing plastic in direct skin contact 24/7 has yet to be examined. 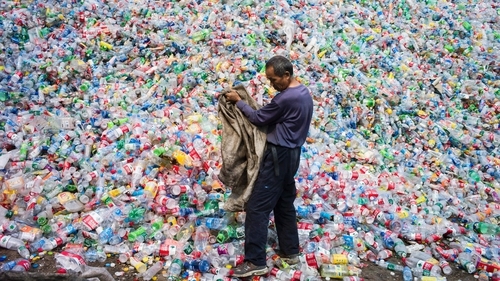 Along with using less single use plastic items, one relatively easy change that many households can make is to switch from disposable nappies to cloth nappies, and from disposable women’s sanitary products to more health and environmentally-friendly items such as menstrual cups and cloth sanitary pads. While this may seem like a lot of extra work, for nappies, it amounts to an extra load of washing every four to five days. We know at this stage that washing clothes made of synthetic materials (fleece, polyester, acrylic, nylon etc) will shed microfibers into the water cycle. One innovation that aims to reduce transmission is the Guppy Friend, a bag which catches microfibers during the washing cycle, which can then be disposed of appropriately. Transmission of micro and nanoplastics in our environment seems inevitable given the ubiquitous nature of plastics in modern life. We need to raise awareness of the lack of knowledge on how this is actually affecting our health and change our attitudes and lifestyles accordingly. Cad iad na himpleachtaí sláinte a bhaineann le plaisteach? Tuairim: cé go bhfuil muid ar an eolas faoi thionchar an phlaistigh ar an timpeallacht, tá taighde ag teastáil chun scrúdú a dhéanamh ar thionchar ar shláinte na ndaoine. Faoi láthair, tá níos mó ná 150 milliún tona plaistigh inár n-aigéan agus bealaí-uisce, agus ar na mallaibh, tá an Aontas Eoraip tar éis vótáil cosc a chuireadh ar phlaisteach aonúsáide mar shampla baitíní cadáis agus soip. Tá cuma gránna ar truailliú phlaistigh ar tránna, agus is léir go bhfuil drochthionchar aige ar fhiadhúlra uisceach ar nós éin, éisc agus turtair; ach fós tá easpa taighde ar thionchar truailliú phlaistigh ar shláinte an duine. Rud amháin atá ar eolas againn ná go bhfuil plaisteach díghrádaithe le himeacht ama, agus briseann sé go píosaí níos lú agus níos lú; micri- nó nana- phlaistigh a thugtar orthu (<5 mm agus <1000 nm). Chomh maith le truailliú le dramhaíl ar nós pacáistíocht phlaistigh, tá méid iomadúil micri- agus nanaphlaistigh scaipthe sna bealaí-uisce ó éadaigh le snáithíní sintéiseach á nigh, táirgí cosmaidí, agus rudaí ar nós eangaí iascaireachta. Ní bhíonn micri- agus go háirithe nanaphlaistigh scriosta go héasca in ionaid cóireála uisce óil, agus tá sé ar eolas againn anois go bith-bhailaíonn said sa bhiashlabhra; tá micriphlaistigh aimsithe i mbia mara ar nós éisc, ribí róibéis agus débhlaoscach ar nós diúilicín, ach freisin i mbia eile ar nós mil, beora, salann agus siúcra, chomh maith le uisce buidéil agus uisce as an sconna. Tá sé i bhfad níos deacra nanaphlaistigh a fheiscint de bharr a mhéid bídeach, agus níl aon modh chomhaontaithe chun iad a bhrathnú sa timpeallán nó i mbia. É sin ráite, tá na micri- agus nanaphlaistigh in ár dtimpeall i ngach áit – tá an deannach ón triomadóir eadaigh agus istigh inár dtithe lán le micrisnáithíní (ionanálú) chomh maith le táirgí cosmaidí (deirmach). Mar sin de, ní mór an iontais é gur aimsigh micriphlaisteach i faecas dhaonna. Arú, an guais sláinte iad? Fadhb amháin ná go bailaíonn gráinníní phlaistigh truailleáin a dhéanann dochar shláinte duinn, ar nós miotail, lotnaidicídí, défheinil polaichlóirínithe…. Tá na truailleáin sin ag eirí níos tiubhaithe ar na gráinníní agus tá said níos dáinséarach duinn ansin ná mar a bhíodh; chomh maith le sin, uaireanta, athraíonn an plaisteach modh oibrithe an truailleán féin. Fadhb eile a bhaineann le na phlaistigh ná go bhfuil siad lán le phlaisteacháin (atá curtha le plaisteach chun iad a dhéanann solubtha) ar nós phthalates agus bisfeanól, a dhéanann dochar ar sláinte atáirghthe na mban agus na fir, agus a chuireann isteach ar fhéatas agus an mháthair ag iompar. Tá neart taighde déanta ar thionchar micri agus nanaphlaistigh ar chórais bitheolaíochta mamaigh nó inveirteabraigh mara. Tá sé ar eolas againn go bhfuil drochsú micriphlaistigh thar an mbacainn gastraistéigigh, ach i gcodarsnacht, trasgluaisaíonn nanaphlaistigh é agus bogann said istigh sna bunfhíocháin. Tá sé ar eolas againn go dtógtar suas nanacháithníní i gcill daonna – tá neart taighde orthu mar córais seachadadh drugaí. Níl fhios againn go fóill an dtarlaíonn sé i ndaoine daonna, ach tá fianaise ann go mbíonn athruithe iompraíochta in éisc tar éis trasghluaiseacht nanaphlaistigh thar an mbacainn fola-inchinne. De réir a chéile, níl mórán tionchar ag na micriphlaistigh ar sláinte daonna, ach feictear fadhbanna atáirghthe oisrí le nanaphlaistigh, agus cuireann said isteach ar fhreagairt imdhíonaigh éisc. Tá i bhfad níos mó taighde le déanamh ar thionchar nanaphlaistigh ar shláinte daonna – níl eolas ar bith againn ar nochtadh ainsealach orainn le cineál diffriúla phlaistigh le modhanna nochtanna iomadúla; tá Institiúd Uisce Ollscoil Chathair Baile Átha Cliath ag tosnú tionscadal taighde faoi láthair chun féachaint air, cheannaireachta leis an Dochtúir Sandra O’Neill, le deontas ón Ghníomhaireacht um Chaomhnú Comhshaoil. Feictear tionchar ag nanacháithníní ar lárchóras na néaróg agus ar chórais atáirgthe daonna, agus is dócha go mbeidh tuilleadh fadhbanna le feiceáil ó nanaphlaistigh agus a leanann an taighde ar aghaidh. Ar an drochuair, níl mórán le déanamh againn duinn fhéin a chosaint ó micri- agus nanaphlaistigh i mbia nó deochanna. Tá taighde ar siúl teicneolaíochta éagsúla a fhorbairt chun iad a aimsiú agus a scaireadh ó uisce óil, ach beidh sé deacair go leor, go háirithe i gcás na nanaphlaistigh. Níl fianaise ar bith ann a deireann go mbeadh sé níos fearr bia orgánach a ithe, mar shampla, agus is dócha go análaíonn muid níos mó doibh ar aon nós – ach seans go gcabhroidh laghdú usáid cáitheadh frithallasán agus vearnais ingne, mar shampla. Bíonn nochtadh i mg/kg níos airde ag páistí ná mar atá ag daoine fásta; mar shampla tá chlúidíní aon uaire in usáid ach ar feadh 30 bhliain – ansin níl tionchar chaitheamh phlaisteach in aice le na baill ghiniúna ar an gcraiceann 24/7 ar feadh 2/3 bhliain ar eolas againn go fóill. Chomh maith le athrú ó táirgí phlaistigh aonusáid a usáid, bheadh sé éasca go leor athraigh chuig chlúidíní éadaigh agus ó táirgí sláintaíocha na mban aonúsáideach chuig cinn níos fearr don timpeallán ar nós cupáin míosta agus tuáillí sláintaíochta éadaigh. Deacair mar a fheiceann sé, do chlúidíní, níl sé ach ualach neachtlann amháin sa bhreise gach 4/5 lá. Tá sé ar eolas againn anois go gcuireann neachtlann le éadaigh síntéiseach (lomra, poileistear, aicrileach, níolón srl.) micrisnáithíní sa ciogal uisce. Nuálaíocht teicneolaíochta amháin a gcabhroidh le sin ná an Guppy Friend, mála a beireann air na micrisnáithíní i rith an ciogail níocháin, le diúscairt ina dhiaidh sin mar is cóir. Tá cuma air go bhfuil tarchur micri- agus nanaphlaistigh dosheachanta, dá bhrí uileláithreachas phlaistigh an saol sa lá atá inniu ann – caithfear feachtas easpa eolais tionchair doibh ar ár sláinte a chur chun cinn agus ár stíl maireachtála agus manaí orthu a athrú mar is cóir. Dr Jenny Lawler is Assistant Professor and Head of the Membrane and Environmental Technologies Group at the School of Biotechnology and DCU Water Institute at DCU.